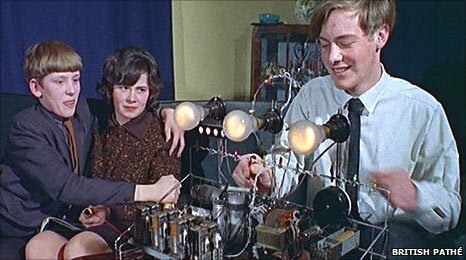 The Snogometer was a kiss measuring device created by British tinkerer Malcolm Pickard in 1965 (he was 16 years old at the time). The device was a bit of a sensation in the UK when it debuted and was the subject of this British Pathé newsreel clip. In a 2010 interview with the BBC, Pickard says he created the device to combine his interest in electronics with his interest in kissing girls. He also noted that the device was probably dangerous and left a coppery taste in the mouths of its test subjects. via Oh Have You Seen This?